Manchester United have beaten Bournemouth 2-1 in a barnstormer of a Premier League contest. The Cherries were much better to start, and grabbed the opening goal through Callum Wilson. United responded well, and equalized through Anthony Martial before the end of the half. 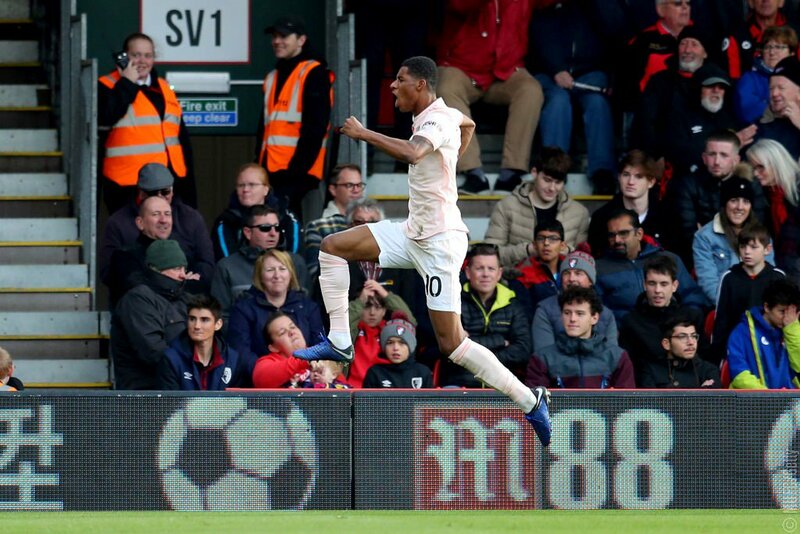 It was a nervy affair to end the game, but the Red Devils managed to win the game in stoppage time after a goal from Marcus Rashford. Mourinho made one change to the side that beat Everton a week ago, with Alexis Sanchez coming into the team after recovering from injury, replacing Marcus Rashford in the starting XI. There was a minutes silence prior to kickoff in honor of Remembrance Day and the passing of Leicester City owner Vichai Srivaddhanaprabha. Bournemouth could’ve had the lead within five minutes when Fraser got by Smalling. He seemed to be through on goal, but a few bad touches took him wide. At the end, his shot was right at De Gea. The home side were better to start the contest, and created yet another chance soon after. It was superb build up play, but came to nothing when the shot from Stanislas was blocked away. They would take advantage of their dominance, and grab the opening goal. A corner was cleared out by United, but the ball was played back down the wing right after. A first time cross on the ground picked out Wilson in the middle, who was unmarked and tapped it in from close range. It was a well worked goal, but United would’ve been disappointed with how easy it seemed to be. The Cherries kept up the pressure, and almost grabbed a fluke second when a cross from Adam Smith wasn’t dealt with, and nearly rolled inside the far post. United created their first chance at the half hour mark. Martial gets open out wide, low cross, Fred bottles it and hits a tap in wide. United did grab an equalizer soon after, which was almost completely against the run of play. Young played Sanchez down the wing, who hit a low cross into the middle of the area. It picked out Martial, who sent the keeper the wrong way to make it 1-1. Alexis thought was he was through on goal after a sublime pass from Fred, but he was ruled offside, even though it seemed like he was even with the last man. The away side really got into the flow of the game at that point. A long ball lumped in was headed down by Sanchez to the feet of Mata. The diminutive Spaniard tried going for the near post, but hit the shot just wide of the target. Bournemouth managed to almost hit back on the counter. Fraser snuck by the United defense, and ripped a shot to the near post, but had his effort saved by De Gea. At the end of the half, United were the happier of the two sides to go into the break level at 1-1. The away side had a great chance to take the lead at the start of the second half. Shaw made a lung busting run in behind, and was played through on goal, but Begovic did well to come out quickly and make a big save. Mourinho made a double change in the 55th minute, with Rashford and Ander Herrera coming on for Juan Mata and Fred. The substitute came close to making an immediate impact, as a long shot from Herrera sped just past the Bournemouth goal. I have no idea how it wasn’t two for the Red Devils at the hour mark. A free kick from Young slammed against the crossbar, but fell right to the feet of Rashford. However, his shot was blocked, and another rebound fell to Pogba, but his effort was cleared off the line at the last moment. In a last throw of the dice, Jesse Lingard returned from injury, and came on for Alexis Sanchez with 15 minutes to go. A big chance fell to the Cherries with ten minutes to go, as Brooks got the ball in space in the penalty area. Fortunately for United, his shot was hit right at De Gea, who made a decent enough save. United really should’ve grabbed a late winner after some tidy build up play. The ball ended up at the feet of Jesse Lingard, who was open on the edge of the area, but he hit his shot right at Begovic. However, they were able to carve out one last chance, and took full advantage at the second time of asking. Pogba did brilliantly to create a sliver of space out wide, and dinked in a ball to the back post. It found Rashford, who mistimed his jumped, and accidentally brought the ball down. Fortunately, it sat perfectly for him, and he smashed it into the net from a few yards out. Manchester will able to hold on to the win, and secure the vital three points on the day. Bournemouth put up a hell of a fight, but the quality of United were able to just get them over the line at the end. Manchester United’s next game is on Wednesday, as the Red Devils travel to Turin to face Juventus in the Champions League.